Ancient Mediterranean and Europe - Minoan civilization originated in Anatolia! Topic: Minoan civilization originated in Anatolia! Subject: Minoan civilization originated in Anatolia! "As for the everything was greek sites i guess you've hit something like this: http://e-e-e.gr - http://e-e-e.gr "
I did not know Macedonia was a country, I always consider it to be a region of Greece, but then again, what do I know? I am only a dishwasher from Brooklyn! But then, these questions arise: "What is a Greek"? "Is one born a Greek or he/she becomes?" ...Or to go a little deeper: "What is the difference between Theory and Dogma?" The famed golden funeral mask of "Agamemnon" I wouldn't trust Schilemann's verdict on this piece though...not every bronze age ruler from this area is instrisically linked with the Illiad! However, two main factors that can be said in refutation against this theory are that firstly, with the advent of the contempary Hittties into Anatolia, the politics and society of that region were really much more advanced - the Hittites developed something of a caste system between the Hittite ruling dynasty and the Hurrian working class. There are also strong implications of a complex system of law with serious concepts of moral responsability. It is not clear at all that Myceanean civilisation had any of this, but they both did share some kind of empire with centres of centralisation (obviously it was harder to achieve this in Greece than in the ancient near east and/or anatolia though, as history has taught us) but (and this leads nicely into my second point) there is ironically less archeological and historical evidence for the Myceanean civilisations than there are for the Hittites. I would say that many of the influences in both of them seem to appear more Egyptian (the "caste system" that is clearly there in Hittite culture, and disputably there in Myceanean culture) and perhaps also Mesopotamian (the principle of the "Palace state"). ...For the last time stop speaking about the Macedonian question as well! It's really not that relevant to what we are discussing now. We have the minefield for that issue now stop it! "As for the everything was greek sites i guess you've hit something like this: http://e-e-e.gr - "
I was ironic about that site, not serious. Makedonas eimai filaraki, oxi tipote allo. Aster I think the statue of the Neo-Hittite King never appeared. Is there any similarity with Agamemnon? Oh - well basically it's the usual Hittite art; not much in the way of anotomical representation and pretty basic approaches to stances. My point was that in contrast to Schilemann's "Agammemon" golden mask, the facial structure is awful and in a lot of Hittite art (like the large rock santuary near Hattusas, begining with T but I can't remember it for the life of me) appears to have impossible stances. I realise that these problems aren't really rectified really until the time of the Athenian black figure painters (such as Sophilos, Kleitas, the oakshott painter, the Phrynos painter, the Amasis painter, Execias, Androkides etc) but some of the near eastern stuff (especially the Egyptian) really does seem much better. Although the Myceanean has some problems like all early art, I see more similarities between it and Egyptian art, because Mycenean seems to be so far ahead of Hittite/Anatolian that I don't really see that much influence. When one regards some of the "Psi" submycean female statues, although they obviously aren't as good as, say the Carayatids of Mnescicles' Erecheteum, at least the have some realistic posture and composition. Aster there are many theories about whos art/architecture etc was developed in Greece. The fact that a wave of anatolian settlers came to Greece does not mean they imposed their art on the people already there. Also, when all these were a theory, i think it was Palmer who suggested that there were two migrations to Greece from anatolia. An early one and one around 2500BC. That means that the first wave of settlers who came under neolithic times, developed a separate art than the anatolian. Anyway, many theories, so far i guess it is only the farming that is pretty clear. The art part has a lot of future research. I agree on the similarities with Egyptian. However, it is not just the Mycenaean art, but the Minoan too. There are similar figures (athena like ones, bulls) and patterns (infinity circles, axes) on several things around egypt and palestine. I don't know if this has anything to do with a possible migration of the aegians after the Thera erruption, but it is something that is easily noticed. Do you have any good examples of images showing a reconstruction of Hittite temples? I think you had posted something many moons ago. There is nothing Turkic yet in Anatolia during the Minoans. Lets not start on that now, shall we?
" I do disagree with what you say but I'll defend to my death your right to do so." But the Minoans weren't Greek. They were a completely different people. Yes, but they became one of the basis for what later became Greek civilization. They might not have been Greek speaking, but they were spreaded from Crete, to the islands, to central Greece (Boiotia) and up to Macedonia (Bottia & Bottiki). In other words they have contributed genetically after several thousands years. The point is that their origin is from Anatolia, like many other people that unfortunately vanished. 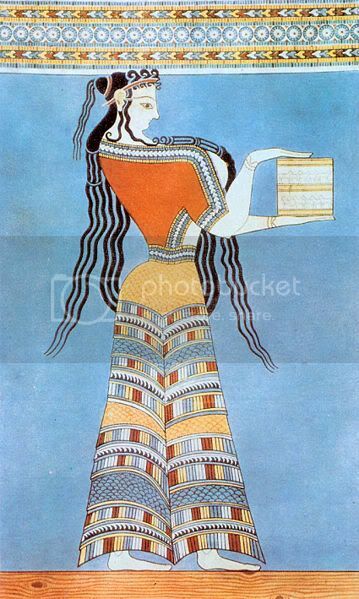 What is the meaning of Minos/Minoan? In Avesta we read http://www.avesta.org/ka/niyayesh.htm - http://www.avesta.org/ka/niyayesh.htm : (I) praise the name of that Minoyan mino, the increaser, worthy to be praised, who always was, always is, and always will be; whose one name is Ohrmazd, the God who is the greatest among all, wise, Creator, supporter, protector, endurer, the lord of righteousness, forgiver, and dispenser of excellent and pure justice. It is difficult to say what "Mino" means in Avestan and Persian languages, it should be a title, "Minoyan mino" is similar to "Shahan shah" (King of kings). Referencing the Avesta to investigate the origin of the Minoans? My god, that's like using the bible to study evolution. Let's get this right. Besides the genetic evidence pointing to a non-Indo-European, Anatolian origin of the Minoans and Etruscans, we have linguistic and cultural evidence. Anatolia is just a region, the actual connection is to the Hurrian. Hurrian names and words are found in the few Minoan writings we have because they are their relatives. In terms of culture, the Hurrians (like their other relatives the Sumerians), believe in the sky diety ANU. Who was transmitted to the Aegean by the Minoans, and picked up as urANUs by the Greeks. So the answer to the mystery of "how were the Etruscans influenced by the Greeks?" is, they weren't. The ancestors of the Etruscans left the Aegean to Italy as the Greeks were moving in. Simple right? The site belongs to the university of Crete, so what you get there is recognised academic work. I like Gareth Owens version (He has many texts on that site) who has studied a vast number of tablets, including many unpublished ones. He points into a Proto-IE language that has words in common with Hittite, Greek and Sanskrit. He doesn't go by names, but he has been able to use many words in general, including ofcourse namings. Also, if we use DIKTIS (the one who indicates in Greek) we might have the original word used in the tabled. Anyway...I can continue for ages, with examples in Sanskrit, Hittite, Tocharian and other indoeuropean languages. Since, the language is unknown to us, you will see many possible translations by many. The thing is that those who specialize in the aegian languages, have use other methods when separating the words. For example, I could very fast make a selection of words from the tablet context and cognate words that would just work for one example. However, the way i showed above is not the way it works...The linguists know how to separate words, find suffixes and prefixes and then recognise verbs, adjectives etc. As for the Etruscans...They moved to Italy more than a millenia later after the recognisable Greek material culture appears in the area. Furthermore, they probably came from Lydia. The Islands, had the Leleges (Carians?) and other aegian populations. I agree on the similarities with Egyptian. 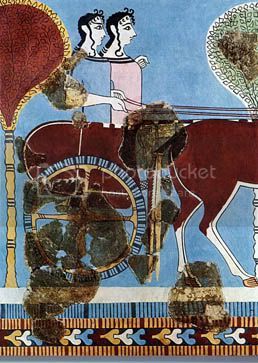 However, it is not just the Mycenaean art, but the Minoan too. There are similar figures (athena like ones, bulls) and patterns (infinity circles, axes) on several things around egypt and palestine. The bull cult isÂ incrediblyÂ widespread ... thereÂ are traces of itÂ in NeolithicÂ and Bronze AgeÂ cultures fromÂ the Indus Valley clearÂ to Italy (possibly further) and everywhereÂ inbetween. However, I doubt very muchÂ that itÂ representsÂ anyÂ movementÂ ofÂ people, it justÂ reflects thatÂ thisÂ area was subject to powerful diffusion. Linguists who only seek out Indo-European sources as explanations are dishonest, especially in Anatolia where other languages predate IE. Infact, these pre-IE languages influenced early Indo-European speakers who were moving into the region from the west. Minoan and Etruscan are not IE, they are related to Hurrian; both derive from the same language family as Sumerian. The mainstream considers all these languages "isolates," to maintain their pet theories, and not have to revise decades of their misinformation to the public. 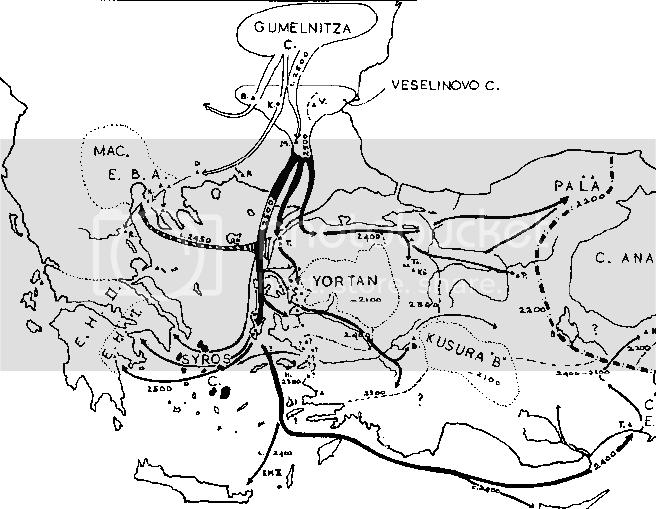 Furthermore, any similarity with IE words near Anatolia or Armenia is based on an earlier substratum (Hurrian). Including Armenian, which is almost blatant because a prominent Hurrian kingdom, Urartu, was located there. Minoan and Etruscan are not IE, they are related to Hurrian; both derive from the same language family as Sumerian. The mainstream considers all these languages "isolates," to maintain their pet theories, and not have to revise decades of their misinformation to the public. I doubt the mainstream cares about the public perception, as most of them publish in scholarly journals most of us do not read, in a language most of us do not understand, etc. However, for what's worth there's little if any to support relations between Sumerian and other language, in particular Minoan. The readings of Linear A are just tentatives, because the symbols of Linear A are assumed often to be a Linear B kind of syllabary and decoded after some similarities which many times lie in the eye of the beholder. Moreover, both the writing and the language evolve, and thus some symbols may change their meanings in time, therefore even the quasi-identical symbols might not have the same reading in Linear A and B (and this becomes even more probable if we think that Linear B was adapted to Greek, for example compare the Cyrillic and Greek alphabets). With all these, some scholars use some sort of Linear-B derived reading in order to move from symbols to words, but when you see a word like "KU-RO" (apparently with the meaning of "total", "sum"), it doesn't mean this was really the word in Minoan. Yves Duhoux has a nice overviewing chapter on Linear A in Christidis' History of Ancient Greek. The mainstream scholar establishment does care about the public's interested in history and related topic. This is why the most recent popular discoveries always deal with the similar themes of "European" Kennewick man and "Celtic" Tocharians. So most of the mainstream support goes to forment popular and romantic beliefs, not objective discovery. We have the legend of the Scythians taking a large chunck of the dialogue, where its mostly the same weak sources echoing of each other, for lack of substantive evidence. The origin of culture that spread neolithic agriculture to the West and East is not in Mesopotamia, its in Iran. It is not discussed simply because they cannot attach Aryan or Indo-Iranian to them, since it occured 10,000 or more years ago. Genetic studies also disprove many old ideas, but again the mainstream is still sticks with the same theories. They overlook the connections between supposed 'isolates' like the Etruscans, Minoans/Pelasgians, Tyrrhenians, Hurrians, Sumerians, Subarians, Caspians, Marhasi, Jeitun, Andronovo, proto-Turks. All the evidence is there in many varied sources, just because the mainstream isnt providing you with a neat little documentary about what they deem to be acceptable truth doesnt change the facts. Your logic is circular. If you address only popular discoveries you'll conclude the scholars care about public's interest, but why address only the popular discoveries in the first place? And why only discoveries? A lot of scholarship is not about discovering but about providing a valuable interpretative framework and of course, working in it. In a lot of fields (like historical linguistics) the amount of new discoveries is limited, but there's a wealth of new information provided by new paradigms and interpretations. Considering that most scholarship is unknown to public and that most scholars write articles in scientific journals instead of writing popular books, it is left to conclude that most of them do no care so much about what the public believes. And you didn't actually address my objections. If the scholars care about the public so much why most of them publish in relatively non-popular journals, why do they use a language most people do not understand? Tocharian is not Celtic, but a Centum language, like Celtic (and like English, Italian and several other languages). But Centum and Satem are merely some isoglosses and actually the position of Tocharian in far-east spectrum of IE languages is one of the main concerns of PIE theories, a persuading PIE theory must explain this fact. As for "Kennewick man" I didn't notice anyone to consider it "European" but "Eurasian" or more precise "north-eastern Asian" but at the same time "American" (the former is only a far origin, according to a relatively well-established theory). The legend of Scythians actually takes a very little part of the dialogues among Classicists, you can browse some scholarly material archive like JStor and do the statistics yourself. The origin of culture that spread neolithic agriculture to the West and East is not in Mesopotamia, its in Iran. It is not discussed simply because they cannot attach Aryan or Indo-Iranian to them, since it occured 10,000 or more years ago. If there's any value to this theory there are studies on it. Your second claim is preposterous, Indo-Iranian is a IE linguistic branchs, it has nothing/little to do with the spread of Neolithic agriculture. Genetic studies also disprove many old ideas, but again the mainstream is still sticks with the same theories. Not all these are 'isolates' (and how can you talk about mainstream if you dont' know what mainstream holds?) and between most of them there are no connections. Several of them are not ever properly known/understood, so exactly what kind of connections could be? All the evidence is there in many varied sources, just because the mainstream isnt providing you with a neat little documentary about what they deem to be acceptable truth doesnt change the facts. If there's any shred of evidence which fundaments your case, I'm sure you'll present it. And I don't know what all these have to do with Minoans and their language. I explained how those mysterious Minoan words were created and how useless is a word-by-word parallel with any other known language. The 'mainstream' is the establishment that publishes information in layman books and other popular media only based on select academic sources. There are many scholars, researchers and archeologists who do work in different fields, and im sure they dont care about public opinion just their work and making a living. But the industry itself pushes only select ideas, sometimes regardless of their validity or value, out to the public. Isnt that simple to understand? Which is why we have many magazines, books, documentaries that talk about history in vague catchwords such as "Eurasian", "Indo-Iranian", "Scythian", "Kurgan" just to get certain individuals tingly. So they talk about the connection between people a quarter of the world away occuring in a short time frame, Tocharians and Indo-Europeans. But forbid you from even hypothesizing that groups sharing similar elements and living right next to each other, Hurrians and Sumerians, might have a relation the same way different IE groups have with one another. So for their pet IE theories they create large "trees" that connect distant groups/languages etc. (which in most cases is fine), but if you do the same with other groups then there's "not any shred of evidence". Just because 80% of IE/Aryan theories are parroting the same line for decades and have accumulated so much BS, you cant ignore newer information and theories that bring forth new ideas. An example is the once universally held belief that the Andronovo complex was the origin of "Indo-Iranians", turns out it isnt, its proto-Turkish. The establishment wont shout this little detail out on any documentary or book, its only found in some recent articles, which require subscription to be seen in full. Compare the amount of occurences different terms appear in Jstor, lets see on what the majority puts more enphasis on. The mythtical Scythians, or actual provable archeological, ethnic groups and sites. No, this is not mainstream. You don't read in layman books and popular media about geminate consonants, athematic suffixes, sygmatic nominatives, and plenty of such things but there are mainstream beliefs, hypotheses, theories on them. A part of the mainstream scholarship gets popularized, but most part doesn't. And a lot of fringe theories get popularized, too. In consequence the most popular beliefs are not always the mainstream beliefs (where in the latter case I relate the mainstream to the community of scholars, of experts). Which is why we have many magazines, books, documentaries that talk about history in vague catchwords such as "Eurasian", "Indo-Iranian", "Scythian", "Kurgan" just to get certain individuals tingly. So they talk about the connection between people a quarter of the world away occuring in a short time frame, Tocharians and Indo-Europeans. But forbid you from even hypothesizing that groups sharing similar elements and living right next to each other, Hurrians and Sumerians, might have a relation the same way different IE groups have with one another. So for their pet IE theories they create large "trees" that connect distant groups/languages etc. (which in most cases is fine), but if you do the same with other groups then there's "not any shred of evidence". Just because 80% of IE/Aryan theories are parroting the same line for decades and have accumulated so much BS, you cant ignore newer information and theories that bring forth new ideas. Hurrian and Sumerian, linguistically, are very different, much more different than Tocharian and Celtic. And indeed, AFAIK, there's no evidence to connect Hurrian to Sumerian. Nice try. Most of the hits are about Scythian arts or other topics. If you'd compare with hits on Roman (over 100,000, albeit not all about the Romans from Antiquity) you'd see Scythian is rather a peripheral topic and the legend of Scythians (I assume you mean Herodotus' account) is even more peripherical. Thus your earlier claim about the "legend of Scythians taking a large chunk of the dialogue" rests on no evidence. Your parallelisms are invalid as there are not so many Middle East or Asian studies journals enrolled in JStor (and Scythians are a topic for a journal like JRS or Classical Philology or Greece&Rome, but Oghuz or Wusun aren't). Excuse me mate, but you say that linguists who seek IE sources are dishonest and you make a link to a site quoting the Gareth Owens!!! Furthermore, the theories suggested on the first link are about Luwian, Indo-Iranian on the IE side and Phoenician on the non-IE side. In that sense neither Cyrus has been wrong with his input. I agree with Chibuldios that we assume things about Linear A, based on the phonetic values of Linear B. Probably, many symbols have the same values but not all of them. We might be reading it completely wrong. Everyone have some suggestion. I'm not saying some of them are more correct than others as long as they use a credible methodology. Evans suggested that Carian was the closest language to the Minoan. His and Ventris suggestions are not based just on the questionable reading of the Linear A tablets but also in the few Minoan inscriptions written with Greek letters, which we know how to read. The Greek letter inscriptions do point to an IE language. Strabo, noted that the Carian language contained many Greek words. Those words were probably not Greek, but words from a older language that was a common ancestor for both Greek and Carian. Also, considering the fact that a big part of the Greek population do have roots from the people living in the Aegian, i would expect to find more traces of Semitic languages in Greek, rather than a large number of words that relate to the Anatolian languages. Semitic words do exist in Greek, but the examples are few. To compare the number of words of Semitic origin in Greek with the number of words of Anatolian origin is out of the question. The large number of synonyms in the Greek language also explain the pre-Greek languages. There are more that 1 word for each meaning, simply because in the second millenium BC, in parallel with Greek, the aegian languages were spoken too. That's why you have words like Pelagos and Thalassa, Petra and Lithos, Phos and Lyks, Gis and Chthon. Here's a good introduction on Linear A, and also a nice collection of texts. Often this reading is marked with a name of its own, John Younger calls it Linear AB, Yves Duhoux abbreviates it LA > LB (where LA and LB stand for Linear A and B respectively). Besides word-by-word comparing, there are few other approaches on decipherment, which IMO have better chances to provide good results. Yes that's a good link Chibuldios. It summarizes most of it. In order not to be missunderstood, I do not dismiss the Semitic theory. It is a suggested theory, that has some basis. However, I'm more convinced with the Anatolian character of the Minoan, because the words suggested link with more languages of IE origin. Also as I mentioned before, statistically in Greek, the remnants of the pre-Greek languages are not Semitic. Also, Miletus was a city founded by Cretans. The native language of the citizens (before complete Hellenization by the Ionians) was Carian and we do have written records of that. We also have Linear A tablets from Miletus. Linear B syllabics have been useful, we have at least 3 indications of geographic names. Two of them are Ida in Crete and Hurrian town Tursa (TURUSA), probably relating to the Tyrrhenians and Sea People. After decades of the same IE and Semitic theories to decipher Linear A virtually no progress was made. Its time too look at the obvious agglutinative forms and other references that point to a proto-Tyrrhenian/Hurrian origin. There's nothing known about a proto-Tyrrhenian language, so I don't see how one could relate Linear A to it. If by Tyrrhenian you mean a language family encompassing Etruscan, then this obviously is unrelated to Hurrian. For what's worth the parallels with Luwian and Hittite yielded more impressive results (touching even grammar issues). Proto-Tyrrhenian in terms of the non-IE languages spoken in eastern and southern Anatolia prior to large wave of migration from that region into other parts of the Mediterranean. We cannot apply phonology that was only suited for studying IE languages to others. You have to consider Hurrian as their root language with other influences, like Luwian and Latin along the way. This is not the "easy" theory, there is still a lot of work needed for Hurrian itself. And there is nothing "impressive" about those IE theories for Linear A, even the IE faithful admit they still don't know what's the language, they only "suggest." Well, let them waste their time trying, it wont change a single thing. Inform yourself more about Hurrian, not just the main topic, but the smaller details which reveal a lot more than an IE-only emphasis. Proto-Tyrrhenian in terms of the non-IE languages spoken in eastern and southern Anatolia prior to large wave of migration from that region into other parts of the Mediterranean. There's no evidence for such a claim. We cannot apply phonology that was only suited for studying IE languages to others. What are you talking about? The syllabe phonology (if this is what you meant) is not at all "only suited for studying IE languages". You have to consider Hurrian as their root language with other influences, like Luwian and Latin along the way. This is not the "easy" theory, there is still a lot of work needed for Hurrian itself. No one has to support a theory if there are no evidences. If a theory is not "easy" then it means it's rather improbable. And there is nothing "impressive" about those IE theories for Linear A, even the IE faithful admit they still don't know what's the language, they only "suggest." Actually I said "more impressive" and that's easily provable because the suggested links between Minoan and Anatolian IE languages are far more substantial than between Minoan and Hurrian or other similar claims. Of course, it may be merely some coincidences and Minoan be an isolate, but the issue at stake here is why to accept a relation with Hurrian and not with some other Anatolian IE languages? Such links suggest you don't understand much of what's written there ... but suit yourself. This is not even an article about Hurrian, but about the name of a deity and its posisble origins in several languages (two main hypotheses are analysed - Hurrian and Semitic). It touches the issue of interpreting Minoan as a Semitic or Semitic-influenced language. It also mentions Hurrian loan-words in Hittite, which suggest, contrary to your claims, that few Hurrian words in Linear A could be interpreted as evidence that Minoan is actually an IE Anatolian language split after receiving few borrowings from Hurrian. Tricky, huh? Lets clarify that the IE-theory proponents tried to use the argument that Minoan must have come from previously unknown IE branch .Its not possible because that would imply an unquestionable connection to root IE words, none which worked. If you look at all the examples provided, its all speculation. If not lets see some examples of the few Minoan samples matching with Hittite??? Comparing Hittite or any IE language to Minoan has been inconclusive, lets get past that point for once or else it will become repetitive. On that link you will find some good information on Hurrian words and forms that were prominently used in the region. If we aren't IE zombies, we can confidently conclude that the users of Linear A had just as easy access to the Hurrian as the Hittite did, but the fact that Linear A is not matching with IE gives us another clue that it might actually be a source of Hurrian itself (in this case to the Greeks instead of the Hittite). When people become more learned they can tell the forms used in Linear A that correspond with common Hurrian ones. An example this mysterious first segment of a 'libation'. I believe Chibuldios has covered some important issues. a) The genetic research was made on living people and samples from neolithic settlements. The Turkish contibution consists of samples taken from areas where people like the Luwians, Carians, Hittites, Lydians etc lived. Those people were not Semitic. b) As I posted earlier, Linear A is not found only in Crete but in the Turkish coast as well. Specifically in areas where Anatolian languages were spoken. I don't have samples of those texts, but two things are possible: I) The tablets contain words found in Crete which makes Carian a language that evolved from Minoan, II) The Carians, like the Greeks adopted the Linear A script to write their own anatolian language. c) Cretans migrated to the Balkan mainland as far as Macedonia. 2/3rds of Western Chalkidiki was predominately Bottiean (Cretan) and later Chalkidean. It is also an area of early writtings, that reveal various people living side by side (Cretans, Euboans, Macedonians, Ionians, Thracians and Carians [Athos peninsula]). Except from Greek, Carian has been recorded, probably Thracian too, but no semitic in any form (words, placenames, personal names). Other places nearby would be Pieria, Emathia and the city of Idomaenae (from the Cretan idomeneas), where again no linguistic or material culture traces point to a Semitic precence. d) Another migration of Cretans, is the one in Orchomenos, Beottia. On the other side of Beottia the Gefyraeoi lived, who are identified as Phoenician people, unlike the Bottians of Orchomenos. e) Now i have a question. Can theories like the one of Cyrus Gordon, render possible sentenses in Linear A, like the ones rendered with the help of Indoeuropean languages? The Carian argument is weak because its only based on speculation what Carian is, which at this point is anything someone "suggests" without providing adequate detail. If you are really interested of where Minoan might have originated, search for Kizzuwatna and focus on the non-Luwian elements. I still see examples of single words. Moreover those words are proposed to cognate with single syllables. That could produce combinations of cognates in a large variety of languages. Give victory destroyer Iphinama and strong and holy Kubaba(Cybele?). Astarti mistress dupere (another epithet of the godness) of Ida and Ifinama the destroyer, give [us] victory. Turusa is compared to the Hittite Turwana, which is the feminine equivalent of Greek Tyrannos. There are more inscriptions relating to the same context. What Carian is? Carian is a written language that appears in billingual documents, therefore we have safe translations of the texts. Also, I've been using this map over and over again. It is based on Palmers hypothesis of the Anatolian invasion of Greece. Look at the placenames in Crete. They point clearly to Luwian origin. Specifically, the -ssos is possesive form of "male" objects while -ssa are possesives of feminine ones. Parnassos in Crete is the same name of the mountain where Delphi relyes in the mainland and renders litterarly into the Luwian Parna (house), meaning "our house". Thalassa in Greek is a synomym of Pelagos and would render as Alas (Alas = Gk. Salt, Alat = Lw Salt ) -ssa (our salt). Melissa renders directly to the Luwian word for honey "melit" (Gk. Meli) and means our honey (bee in Greek). Ierissos, in Chalkidike renders to "our holy" from Greek Ieron and Carian Jeru which means holy. Kissamos in Crete can be found as Kissabos (alt. Ossa) in the borders of Thessaly and Macedonia. Therissos in Crete has again the typical -ssos ending. Tylissos needs no comments...Just a quick look on Athenian pre-Ionian placenames solves a lot. I'm not a IE zombie and I can't agree with your conclusion and another non-IE-zombie, John Younger, happening to be also a scholar also disagrees with you: "Since Crete appears to have been deliberately colonized in developed Neolithic, probably from SW Anatolia, it would seem logical to assume that the Minoan language was related to one of the Indo-Hittite dialects, most probably Luvian" - I already linked this material, but you failed to notice and/or read it. Actually except for a handful of scholars, most do not give an extraordinary credit to the IE hypothesis, however I couldn't find so far scholarly support for your claims. ThatÂ would beÂ fine, exceptÂ thatÂ those namesÂ areÂ almostÂ certainlyÂ notÂ theÂ original Minoan namesÂ forÂ those places. EvenÂ ifÂ theÂ root is Minoan - forÂ whichÂ thereÂ isÂ no evidenceÂ -Â the suffixesÂ certainlyÂ aren't. That would be fine, except that those names are almost certainly not the original Minoan names for those places. Even if the root is Minoan - for which there is no evidence - the suffixes certainly aren't. Suffixes in many cases are actually morphological desinences and usually languages get loanwords but use their own morphological rules (a bit harder to see in English, but it can be easily noticed in loanwords in languages with a rich morphology). Greek has a lot of words which scholars identified as non-Greek in origin, but for many they do not look non-Greek. Names like Knossos, Parnassos could be very well an Anatolian word with typical Greek morphology (in this case a sygmatic nominative). Based on the information Flipper provided, a Luwian place name could look like *Parnassa. But what would they be? If the Minoan Kindom declined around 1600BC because of the tsunami of the Thera erruption, who were the ones to change the placemanes within just 150 years? 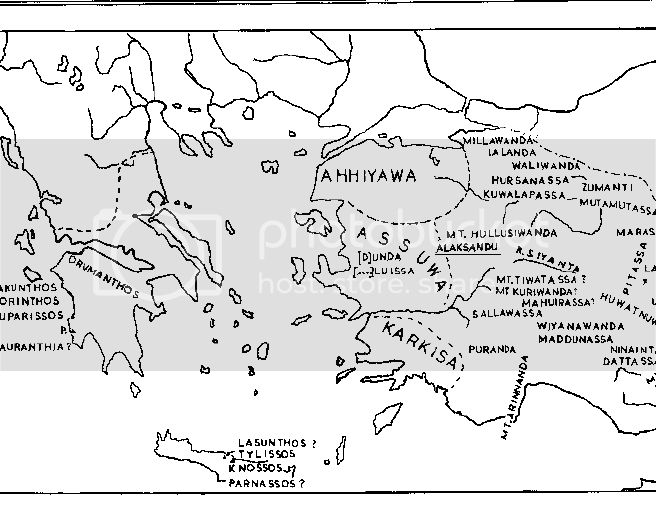 The Greek speaking populations had already founded cities in the mainland, so they would be aware of a later Luwian invasion between 1600-1450. Moreover, the Greeks seemed not to bother that much about changing the placenames, since they were already in use. The -os endings might be tricky and seem Greek but in many cases non-Greek placenames/names look Greek in the Balkans and Anatolia. The difference between a Greek name and a non-Greek name ending in similar suffixes is that the Greek names have always an explainable etymology. Like the example of Parnassos, it might sound Greek directly to a foreigner but it doesn't mean something in Greek. Thracian names can in many cases sound 100% Greek, but are easily identified as non-Greek because of the lacking Greek etymology. Phrygian names can fall into the same category in most cases. Sometimes, the names can be almost the same, with the difference that the Phrygian version might be like "distorted" Greek with switching of consonants. Just a quick example for you edgewaters, to see what i ment with the post above. Which of the following names are Greek, which Phrygian and which are Thracian? Believe me, unless you happen to hit on them sometime, it is not easy at all to tell. Other sources that connect Hurrian people to those in Cyprus, Crete, and Etruscan lands. It is generally accepcted that the examples of this type found in Asia are Urartian, and that most of the Aegean examples are copies by Greek workmen of the Vannic [Uratian] originals. The question of the route used by the metalsmiths who brought Urartian bronzes to Etruria calls for some discussion. In this there is a little doubt of the importance of Crete. The close relationship between the Barberini base and the "Zeus" shield from the Idaean cave in Crete has already been noted...But there are now further indications which point to an Urartian origin not only for the Barberini cauldron base but also for the "Zeus" shield. Some scholars would be prepared to see here indications of Asiatic-Italian contact attributable to the Sea raiders with their Asiatic cut-and-thrust swords, amongst whom we can number the earliest Etruscan invaders...it would follow that these first invaders, who may well have originated as far away as Eastern Anatolia and Transcaucasia, were followed up by settlers and metalsmiths from the Urartu-Azerbaijan region who kept in touch with their original homeland.. The Armenoid type, of which we can find so many examples in Early Etruscan Art, is to be found at home in Urartu and in the areas controlled by her in North Syria. ...we have in Cyprus examples of the bronze winged sirens, but with a bull's not a human head, of a type which can be found among Urartian bronzes at Altin Tepe and Karmirblau, and also in Samos. This equipment is shown on the "Hunters" shield from Mount Ida in Crete and on the Bronze quiver and belt from Knossos, Kunzer....The close resemblance between the helmet, belt, and short tunic of the "warrior" relief on the Boghazkoy [Hittite] gate with that worn by the soldiers on the Cretan bronzes raises the question whether in fact the Boghazkoy relief may not belong to the same period (8th century, so it originated earlier); the Transcaucasian analogies to the axehead certainly reinforce this suggestion. Kunze also lists siren figures from Olympia which he considers undoubted imports. These siren figures are closely comparable to the Vetulonia examples anc can be constrasted with others from Olympia which are obvious Greek copies of Urartian originals. There is one suggestion about a Hurrian connection with Cyprus, as well as there's a theory of Illyrian connection (!) with Cyprus, as well as a Finnic connection. Basically, there's a wild theory for everything in history. Why draw such extremes though and bypass main problems when you have more logical explanations? 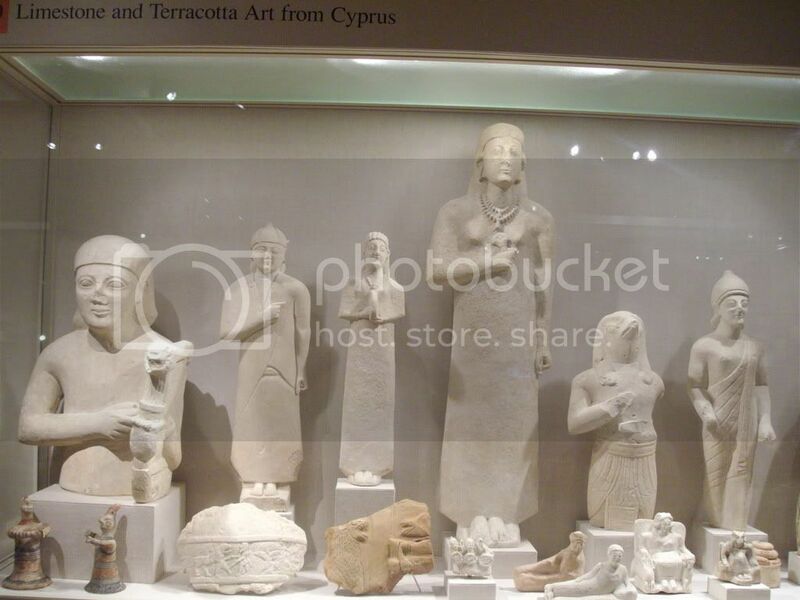 Cyprus is located in an area that was surrounded by afro-asiatic speaking people and anatolians. The eteocypriots were using their language as well as the mixed Arcadocypriot dialect of Greek until the 4th century. They have written billingual documents that are readable both in plain greek writting and Linear C (The Cypriot Linear script). Meanwhile, on the north shore a language that i call "a mixed product" develops by Greek and Anatolian populations. Namely, the Pamphylian dialect of Greek. It incorporates Greek, heavily influenced by anatolian elements and even Phrygian. Nothing strange about that considering the populations living in the area, while the name itself means "land of all races". Another interresting note is that Cyprus born Aphrodite as she was known to the Greeks had the name Anassa. Anassa means "breath" in Greek, but it seems like a borowing from the pre-Greek anatolian languages. In order to stick to that ana- prefix, another example is the syllables a-ro-to-wa-na-ko-so-ko. The wa-na-ko cognates with Linear B syllables like wa-na-ka, wa-na-ka-te, wa-na-ka-te-ro etc all products of wanax (later greek anax). The first syllables (a-ro-to) is probably arto, equivalent to the greek aristos. Note as well, that the Arcadian populations that settled in the island have their own story. They and other pre-Doric, pre-Achaean people of Peloponesus were autochthonus, no matter if their speech developed in such way to fit in the Hellenic group of languages. As O. Masson (a history of ancient Greece, Cambridge) notes on the eteo-Cypriot names, they can be identified as Greek partially but with non-Greek endings e.g Ni-ka-to-ro, A-na-sa-ko-ra, A-ri-si-to-no-se. Enough with the anatolian part...Let's see the south and eastern populations. Skylax, mentions the "Lepethis of the Phoenicians". When I look at archaic Cypriot art it's more than evident that it has more influence from Phoenicia and Egypt than any other non-Greek civilization. Well, Mycenaean were Greeks - no doubt - before real Greeks coming in, further, they spoken an archaic Greek language or dialect. Conversely, they adopted a lot of pre-Mycenaean Greek words; basileus, galaktos, (w)anax, etc......... are Greek at all. Even nowdays Greek language contains 40% or even more of Greek non-IE lexicon. A clear sample is '(the) Sun', helios in Greek (like German Sonne, Lat. Sol, Russian Sol-ntze, etc......), which is IE; even talÃ´s it means '(The) Sun' and it is Greek non-IE, obviously, a sub-strata word. 40% non-IE lexicon is far fetched...Where did you get that number from? If that was true then it wouldn't be classified as a fully qualified IE language. How would Phrygian and Armenian which are clearly IE languages, stand close to Greek while other non IE languages don't? I second Flipper, 40% seems just too much. Anatolia included several different cultures and people, not all of them were IE. Second, the Phoenicians came after regular maritime trade was ocurring between Syria, Cilicia, Crete, Cyprus, etc. The same with the Greeks, who followed after the Minoans were already active in the Mediterrenean. Chilbudios: "Helios seems IE ( s before vowels becomes h in Greek )"
Yes, it is perfectly Greek-IE. Chilbudios and Flipper: "40 %......". No problem. Meanwhile language is classified or belonging to this or that group or family (mainly) by grammar (morpho-syntax); lexicon is split in percentage, e.g: Language ABC (any), could have a lexicon of 22% from 1, 15% from 2, 9% from 3. 1, 2, 3 stands for any other language. CiegaSordomud: "Anatolia included several different cultures and people, not all of them were IE." It is true. Hittite itself is IE, along with Luwian and others; but the lexicon clearly shown a sub-strata elements. Plus "Second, the Phoenicians came after regular maritime trade was ocurring between Syria, Cilicia, Crete, Cyprus, etc. The same with the Greeks, who followed after the Minoans were already active in the Mediterrenean." Flipper: ".Where did you get that number from? If that was true then it wouldn't be classified as a fully qualified IE language.". Prof. Onofrio Carruba told me a 40% of Greek is not IE. Chantraine, Boisacq, Walde-Pokorny, Frisk, etc...... (more or less) are not unlikely. Prof. O. Carruba actively working until 2006 at Pavia University in Aegean-Anatolian studies; he is now retired. So, if somebody think to a "Minoan civilization originated in Anatolia", I agree; plus "non-IE and non AfroAsiatic (or Ham-Sem. )", [I agree] double up. No problem. Meanwhile language is classified or belonging to this or that group or family (mainly) by grammar (morpho-syntax); lexicon is split in percentage, e.g: Language ABC (any), could have a lexicon of 22% from 1, 15% from 2, 9% from 3. -borrowings from other languages: Semitic languages, other IE languages like Persian or Latin, Turkic languages etc. It seems to me quite unlikely that the archaic non-IE words (substratum plus very early borrowings and their derivations) would go up to 40% in modern standard Greek. Perhaps all non-IE words (i.e. including relatively recent loans from languages like Ottoman Turkish) and their derivations, but even then I'm not so sure about it. Does it seems to me that you perfectly understand how language it working. Ancient Greek contains a lot of pre-IE lexical items, a small percentage are clearly Semitics. Once again, you are perfectly all right. Sub-strata [or pre-IE] include also borrowings. Newcomers followed ancient traders' route. My assumption is based on the available evidence. [Pre-Greek: ph= phi, th= theta, kh= khi, e^, o^= eta, omega, y= upsilon. PNC : sh = fricative, xh = uvular fricative]. Look: Pre-Greek a-, ai- > Hurrian and PNC * 0- [zero]. First one is interesting, for the simple reason A-M Tremouille and Ilse Wegner explained Hurrian goddess name Shawushka as derivative form from [adj.] shaw-'great' , that is mean '[The] Great one'; and it is not a coincidence that PNC form for 'height' has similar phonological feature. So, Pre-Greek 'princely [youth]' as Aristarco wrote, it agree with Hurrian goddess name (and adjectival root) and PNC 'height', also I proposed a common root as * (ai)shwe- or similar then, at the end it described 'smth or smb on top'. Something similar [semantically] exist in Greek-IE, words like oi megaloi or Aristo-cracy. Sha is an Elamite word for Great. Found in the name Napirisha, "Great God." It might be also where Persian Shah (king) derived from. I am not surprised about that. This is what prof. John Colarusso (McMaster Uni., Ontario, Canada) like to hear of. He wrote to me to a possible macro-family including Elamo-Dravidian and NorthCaucasian languages. Personally I prefer to work to an Aegean-Anatolian sub-strata and ProtoNorthCaucasian - including Hurro-Urartian and Hattic - languages link, in so far more reliable. About your assumption and examples, on one hand akhyron (I'll preserve your transliteration conventions) was recently proved to mean (also) "straw" (see Chadwick's corrections of LSJ), thus your second example contains a semantical identity (if the Hurrian form is correct, I know little about Hurrian) and thus is more persuasive than it originally looked. But on the other side, I'm not so sure about some other aspects of this hypothetical link. 1. Is aisye^te^r the original form of this word? In LSJ: aisymne^te^r, -e^ros "ruler, prince" (Homer, Iliad, 24.347); looking in several editions of Iliad, I found both aisye^te^ri and aisymne^te^ri in text, I wonder which is the original one? I also looked in the glosses of Hesychius, and I found aisye^te^ri (A 59), aisymne^tai (A 63) which I located in Homer, Odyssey, 8.258. I usually go with linguistic theories where evidence is strong and interconnected. I am skeptic about those hypotheses and theories built from few examples. Certainly, you may have more aces in your sleeve to support this a-/ai- in Pre-Greek which vanished in PNC and Hurrian, but until the proper evidence will be mounted (here or in some scholarly studies), I think it's wise not to attach pre-Greek to another language for which we do not have persuasive evidence, even for the simple reason that will bring a bias in our future researches. And I did not yet understand, how could one tell in such a case when it's a genetical link and where there are two languages in contact which get to share some vocabulary, some phonological features, etc.? 'Persuasive' evidence is hard to come by, especially with relatively unknown languages. Still, a hypothesis can be made, and some form of relation can be created. To me they key is not diverging into either extreme of an argument, becaused the nature of language/cutural formation is varied. Not a single explanation can apply in all cases (for example, some of those Pre-IE roots in Greek could be from a population native to the area, proto-Kartvelian/South Caucasian, or a later arrival like Hurrian). These are probable cognates between Etruscan and Sumerian. Althought they are sometimes labeled as 'false' cognates due to fewer evidence. You have to think of the probability of having this set of basic words to be very similar to each other. Sumerian being more ancient and becoming extinct sooner, I wouldn't attribute it as an absolute direct ancestor to Etruscan, but there is definetly a connection. Sumerian was used as a classical language for thousands of years after it was replaced by Semitic languages. There is a probability that it survived into western Anatolia, used by some elites in a Hurrian or post-Sumerian population, and it entered into the founding Etruscan population. This viewpoint is very similar to that of Urartian, which some consider to be a conservative, classical form of Hurrian. Preserved over time as intrusions of other languages (mainly IE) became common. I have not much time to comment much right now, but before this goes out of control, i should start correcting some elementary mistakes. Talos is 100% indoeuropean...It is from the IE (s)tal- which means "to stick out" or "extend out or project in space" or in a more informal way "to jut out". Cretans used Talos as an equivalent to the Sun. The sun does many of the things above. It sticks out from the horizon and projects its light. The Greek equivalent of Tal- is Stel- like the IE-root word. E.g Stelechos. In Germanic languages the root is Stal-. In Celtic, i'm not 100% sure but i think it is Tail-. Also, you have another IE root of Tal- which means "sprout". Taleos or Talios is the word in Greek. Tala is in indian and i think it also corresponds a palm tree. When one wants to see in linguistics a positivist discipline and not some speculative wordplay then he has provide evidences even for hypotheses. "Relatively unknown" is not an excuse, but a reason to be careful, decent, rational. Let me give you an example I am very familiar with. Thracian is a relatively unknown IE language. However, some scholars identified isoglosses, relationships, etc. How did they do that? For instance, the isoglosses were drawn mainly from the toponymy were based on more than 100 names and most of matches are perfect and most of the variations are completely regular (for instance, justifiable by the changes in prounciation and spelling in Ancient Greek and Latin)! (and the material is now improved with studies on the epigraphical record, including anthroponymy, etc.). In such conditions how would you expect to make plausible a case based on few words? The probability of some words to be very similar in two unrelated languages is higher than you'd expect (please check the link from my previous post). Dont even compare Thracian with Hurrian. We know a lot about IE languages and can make pretty good comparisons with others we already have information on, and in most cases its like comparing dialects if you get to a close enough language. With what 'macrofamily' are you going to compare Hurrian or Etruscan to? Its not that simple. Actual work has been done with Uralic/Etruscan, Hurrian/North Caucasian, Elamitic/Dravidian, and their proof has been acceptable thus far, except to the extremists on the other side that dont accept any language connections except IE. So you also have to be rational and at least keep some tentative hypothesis at your disposal until further evidence comes. We actually know much more of Hurrian than we know of Thracian. Because in Hurrian we have tens of inscriptions while in Thracian some 3-4 (all virtually untranslated, almost any scholar studying them came with his own "translation", actually some groundless speculation based on some assumed IE cognates). In Hurrian we can articulate full sentences, but not in Thracian. We know some things about Hurrian grammar, but very little of the Thracian one. True we know several important things about Thracian, something about its phonology, we have some tens translateable words, we know very little about its grammar, but that was my point. These small things are the result of a much more solid corpus of evidence compared with what usually it is given to relate Sumerian to Etruscan or whatever other similar exotic links. We don't need macrofamilies if we don't have the proper evidence. Sumerian is usually labeled as isolate and that is a good enough description given our present knowledge. What you call 'actual work' is rather controversial scholarship, because of the failure of those scholars to present persuasive evidence. Your position to label the other camp as 'extremist' is disingenous considering the normal thing is to provide proper evidence and this did not happen (and it's not at all related to IE connections, no one would oppose Semitic or Altaic or whatever other connections if proper evidences are given). How could be one extremist just for asking a persuasive case before blindly believing in a hypothesis? To be rational is to be skeptic when facing such speculations. Tentative hypotheses are often sources of bias. And considering what you posted so far (pushing the links between Hurrians and whatever other Mediterranean people), I think you prove my point. I usually go with linguistic theories where evidence is strong and interconnected. I am skeptic about those hypotheses and theories built from few examples. To be skeptic it's fine. Problem is when it persist endlessly. Unetymologized words must have a cognate somewhere, unless is really impossible. Mind ! Hittite and Mycenaean Greek scholar(s) (who's string those language to IE family) were baffled at beginning; only after (a) decade their theory has been accepted. Yes, it is. I have got 100's of such comparison accepted even from accademics people. I think it's wise not to attach pre-Greek to another language for which we do not have persuasive evidence, even for the simple reason that will bring a bias in our future researches. This is a very interesting question, and it is part of 'Basic in Linguistics'. By Syntax, word order S(ubject) - O(bject) - V(erb), so : SVO, SOV, VSO, VOS, etc......; plus A(djective) - N(oun) or viceversa (NA ~ AN). By semantics. It make sense in my own language (or group or family) not in the other one(s). By other minor aspects. Mind ! There is a lot of (pseudo) words with no root: Nursery (CV x2, like tata, juju, caca, lili, etc.........) and onomatopeic (e.g: English spalsh, clap, etc.......). History, environment, (possibly) contact with others, hisorical development, means (of life), etc.......are also part of Glottochronology. Once you set up all this feature (with few exception(s)), you are safe and........peace of mind. Exception should be treaty as part of secondary rules or borrowings. I don't think one can forget being skeptic just for the sake of not being skeptic endlessly. The end should be marked by evidence. There are a lot of words we can't etymologize, either they do not have cognates or if they do, they do have in languages which are extinct and unknown or partly known. As for the history of linguistics, for a succesful theory there are a lot of speculations which were proved wrong. And let's not forget that the discovery of a language like Hittite or Mycenean Greek was caused by a large corpus of texts, something we don't have for pre-Greek (if it is only one language and not several). There's no similar discovery of an unattested language, the ones we know so far were built with perseverance, consensus and caution over many decades (or even centuries for languages like PIE). However, the history of linguistic discoveries can teach us some precious lessons. Let's take Hittite, for instance. Many of the early "decipherments" of this language were mostly wrong, In late 19th century Sayce "deciphered" the bilingual Hama inscription, however most of his sign identifications were wrong. Even after Winckler discovered the great BoghazkÃ¶y archive, there were still scholars like Weidner going in the wrong direction in their attempts to decipher this language. The scholars of early 20th century didn't know, for instance, of Suppiluliuma, but of Supalulu (as they read this name from Egyptian inscriptions). IIRC in those years Knudtzon alone speculated Hittite to be an IE language (based on several texts, however) but later retracted his hypothesis not having a solid basis to support it. The wide acceptance of Hittite's IE character came with the work of the Czech scholar Hrozny, who's usually also credited with the first real decipherment of this language. Let's also note that Hrozny initially thought of Hittite as a non-IE language. In an interview in a Czech publication Hrozny declared about his daring hypotheses (my translation from Romanian, which in turn is from a book translated from Czech): "I like to mention that I do not care at all about my hypotheses and I gladly sacrifice even the most beautiful hypothesis of mine if it results in knowledge leading to scientific truth, the only one which I'm interested in." Mycenean Greek has a similar story. It was long before that Linear B, a "Minoan script" (as thought by Evans, more exactly he thought of it as some sort of revision of Linear A, but encoding the same language) was recognized to be an early form of Greek, and this recognition came with proper evidence, Ventris' decipherment. Let's also note that Ventris held stranger initial hypotheses, like several other scholars in his time, i.e. that "Minoan" and Etruscan were related. Also before Ventris actually came with his deciphering, a lot of strange theories relating Minoan words to Greek, Basque and other languages, some ridiculed by Ventris himself. For instance, in an article published in AJA in 1940, he mentions Stawell's reading of Minos as "Mother, Nymph, Savior" (Stawell actually went further in suggesting that the language of Phaistos Disk is also some variation of Ionian Greek). Though Linear B was eventually proven to be an earlier form of Greek, that is untrue for the other Aegean scripts and moreover her "evidences" are today regarded as inacceptable. The morale of such stories is that the hypotheses lacking solid evidence were often wrong and arguably fruitless and even burdensome, considering the bias they caused and the effort needed by scholarship to discard them (Beekes himself argued on pre-Greek theories "'Pelasgian' has done much harm and it is time to definitely reject it"). And which are the most persuasive evidences in this direction? I hope you don't mind my doubts, but on the whole I found that comparision rather unpersuasive. Besides that unanswered question from my previous post there are also several phonological incongruencies or at least doubts (e.g. the vocalism). And besides, when checking the scholarly perspective of Pre-Greek, apparently the most wide-spread opinion is that we can't assign it with a reasonable certainty to a single other known language. For instance, Yvex Duhoux on pre-Greek in A History of Ancient Greek (A. F. Christidis ed., 2007), Anna Morpurgo Davies in the chapter "The linguistic evidence. Is there any?" in The End of the Early Bronze Age in the Aegean (Gerald Cadogan ed., 1986) and even R. S. P. Beekes. It was rather a rhetorical question (but I wouldn't have minded to be proven wrong). Though I disagree with some of the details of your presentation, you seem to admit that a case for pre-Greek (or any other relatively unknown and unattested languages) cannot be safe because we can't "set up all those features". About Mycenaean and Hittite, an IE theory has been accepted time to time. Further, Rosetta stone make Egyptian decipherment easy and reliable; unfortunately, not all ancient languages had a 'Rosetta stone'. I do not mind if you arise some doubt, it is coherent with your point of view. The phrase "we can't assign it with a reasonable certainty to a single other known language." it is correct, as prof John Colarusso wrote to me "Linguists are notoriously conservative". Some linguists are 'hunters'. They try any effort, exact matches and good result coming from hardwork, not easy way. Years ago (10-15), I already saw NorthCaucasian feature in Pre-Greek language; infortunately I did not have materials (books, Internet, etc....) or scholars to talk about; plus no books edited outside U.S.S.R, very rare and in rubbish paper. Now is different, I collect a lot of stuff, I do any effort for the best result; NOW scholars do not reject my proposal. I hope you (and all Forum) understand.